The harbour of Westpoort is a major point of entry and departure from ships in the North Sea and the Atlantic Ocean. This industrial area is also the site of many national and international companies whose businesses relate to shipping. Though it is considered a stadsdeel of Amsterdam, Westpoort is not run by a local government but by the central municipal council. Visitors often start their journey into Westpoort at Sloterdijk station, where there are buses to take them to the harbour and to other places in the district. The district is divided into the smaller districts of Teleport, Sloterdijk I, II and III, De Heining and Havengebied, which is the harbour area. Westpoort has a container terminal, a power station, and recycling yards and factories. 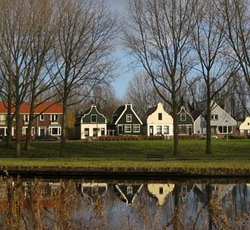 Westpoort is mainly industrial and only has around 100 homes. It is large in size—about 500 hectares of land are available as business sites. These sites are divided into lots of varying sizes that can be used by distributors, manufacturers, exporters, recyclers and other companies. To date there are about 45,000 employees of 1,500 companies based in the district.